Free Rice was designed and installed for a show of proposals, an exhibition in which the works presented were the presentations of concepts which the artists could not complete or materialize on their own. The installation/ performance took place at the parking garage, located at 720 Grant Street in Denver, Colorado. 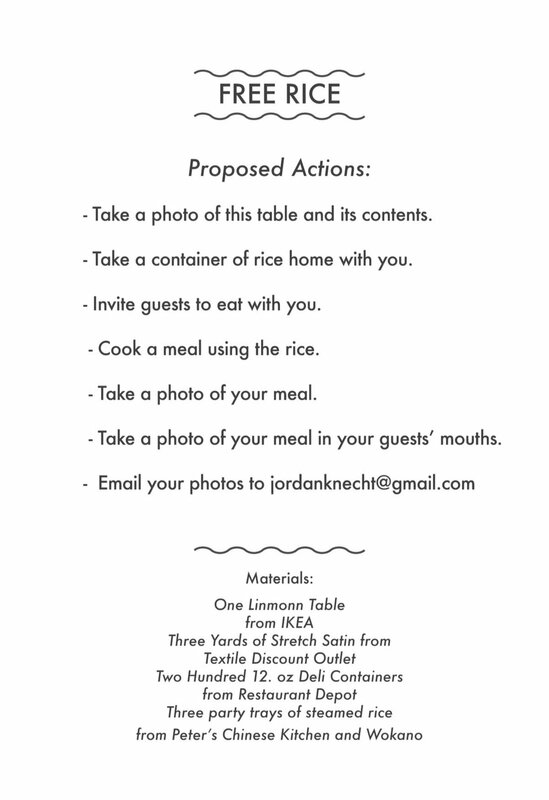 Materials: One Linmonn Table from IKEA, three yards of stretch satin from Textile Discount Outlet, two hundred 12. oz deli containers from Restaurant Depot, three party trays of steamed rice from Peter’s Chinese Kitchen and Wokano.